Why NOT to Repair a EPDM Rubber Membrane? When is an EPDM Rubber Roof Roof beyond repair? This article explains why it is not wise to repair an EPDM Rubber Roof. The image is an example of an EPDM Rubber roof installed before 2015. 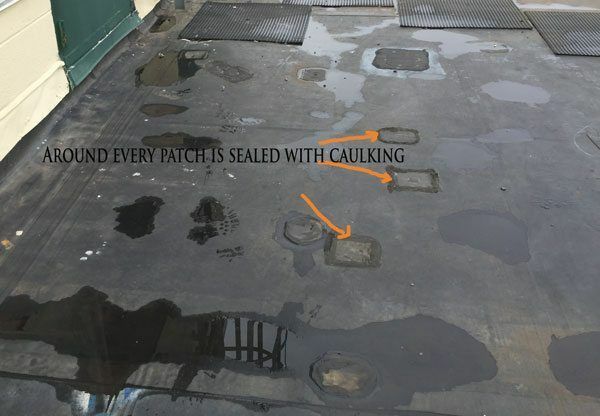 The patches are a sign when to quit repairs on an EPDM Rubber Roof. This is what a EPDM Rubber Roof looks like that is beyond repair. Failing seams will allow water to get underneath the rubber membrane and cause the cover board to rot and flatten out. The fasteners or screws that secures the cover board does not give and pushes through the rubber membrane. Thats why so many patches on this EPDM Rubber roof becomes visible. The extreme heat during summer months can rise the temperature to over 160 degrees Fahrenheit causing the adhesives that bonds the rubber seams together to fail. Most EPDM Rubber Roofs fail prematurely due to the adhesives that breakdown. 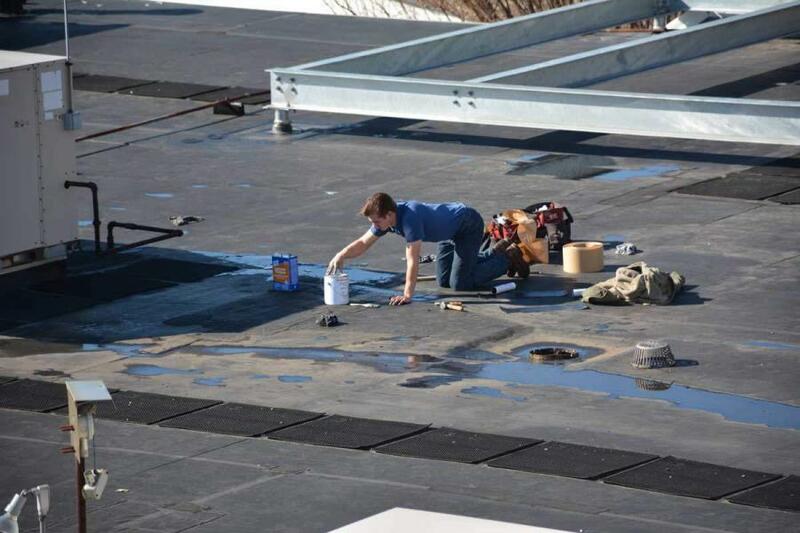 Ultraviolet rays and the heat beating onto the black EPDM rubber roof causes the adhesives that bond the seams together to break down causing leaks. In most cases, an EPDM roof starts showing signs of failure between five and eight years. The repairs quickly escalate, and before you know it, you could have had a new roof for the price of all the repairs. All EPDM Rubber Roofs installed before 2015, are bound to fail prematurely. The reason is that the adhesive that was used to bond the seams together failed due to ultraviolet degradation. Repairing these rubber seams became costly, and was better off to install a new roof. The revised method of installing an EPDM Rubber Roof is to use seam tape. Although it appears to be an improved system, it is too early to know if these seam tapes will withstand the ultraviolet and extreme heat on a flat roof. There are many factors that must be taken into account whether a roof should be repaired or not. How can someone tell that the roof needs to be replaced? Why do EPDM Rubber Roofs fail prematurely? In the video below you will see the flashing tape on an EPDM Rubber Roof failing due to extreme heat. It is the adhesives that fail and then finally causing leaks. The images shows an EPDM Rubber Roof that is being patched. This common practice to patch EPDM Rubber Roofs after five years of installation. EPDM Roofing Materials are constantly being patched – this is a sign that the materials fail prematurely. Notice in the foreground all the patches. The rubber mats are to protect the rubber from foot traffic. No one ever follows these protective matts. The thickness of an EPDM Rubber membrane is less than that of a quarter and can easily be punctured. Maintenance crews always leave nails and screws on roofs. Broken sea shells dropped by seagulls can cause punctures. This shows that a nail can puncture and EPDM Rubber membrane very easily. This an image of a Modified Bitumen Torch Down membrane. Notice the thickness of the membrane. Not only can this membrane not be pierced by sharp objects, but it is also ultraviolet protected. Notice the white ceramic granules embedded on the surface.